"The supply of time is totally inelastic. No matter how high the demand, the supply will not go up. There is no price for it and no marginal utility curve for it. Moreover, time is totally perishable and cannot be stored. Yesterday’s time is gone forever and will never come back. Time is, therefore, always in exceedingly short supply. Time is totally irreplaceable. Within limits we can substitute one resource for another, copper for aluminum, for instance. We can substitute capital for human labor. We can use more knowledge or more brawn. But there is no substitute for time. Everything requires time. It is the one truly universal condition. All work takes place in time and uses up time. Yet most people take for granted this unique, irreplaceable, and necessary resource. 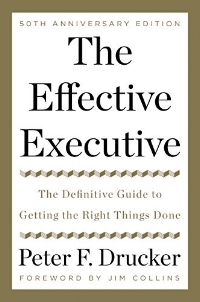 Nothing else, perhaps, distinguishes effective executives as much as their tender loving care of time." Time is a pretty unique thing. I’ve recently started the habit of evaluating how I spend my time by looking back on my calendar every couple of months. When you’re going from meeting to meeting to meeting all day it’s really easy to think you’re spending your time wisely. I’ve found that I’m often not. And doing a frequent look back helps me change that. When I interview job candidates, one of the questions I almost always ask them is: "If I was going to start doing your job tomorrow, tell me something that you know that would make me better at the job that you didn't know before you started?" You can learn a lot from the answers you get. With that in mind, 2014 marks the 15th year that I've been a working "professional". During that time I've worked with start-ups in e-commerce, real estate, finance, biotech and healthcare. I've been in some fast-paced and really competitive environments. And I've made a lot of mistakes and learned a lot of stuff that I didn't know before I started. 1. It's a grind. Work is hard and painful and complicated. If it's not a grind then you're probably not trying hard enough. Get comfortable being uncomfortable. 2. Be candid. Try to facilitate a work environment where if someone is doing well you tell them instantly and if someone is not doing well you tell them instantly. Get used to being honest and upfront about what's working and what's not. This is only hard when your culture isn't used to it. Force people to get used to being candid. 3. Assume that most people are lazy and incompetent and what you want from them isn't important to them. This definitely isn't always true, but you're better off assuming it is. 4. There's no such thing as sales. There are just two parties trying to do something good for themselves and their families. Everything is driven by self interest. Never defer to a buyer. They're not doing you a favor, they're getting something and you're getting something. You are equals. Act like it. 5. Cannibalize yourself. Too long to describe here. I wrote a post on this a while back. But in short, put yourself out of business before someone else does. 6. Always do the the right thing. Don't take credit for other people's work. Publicly recognize your peers that are doing good things. Share your ideas and insights with other people. Don't go over your boss's head. Help people. Don't one-up people. Do the right thing. Don't think about this from an ethical perspective. That might make it too blurry. Think of it practically. I'm telling you with 100 percent certainty, it might not feel like it at the time, but I promise you that doing the right thing is better for you in the long term. 7. The worst trait in a colleague or a boss is insecurity. Avoid insecure people. And avoid insecure managers like they have a contagious disease. 8. Manage yourself harder than your manager manages you. Don't even make it close. If your performance is being actively managed by your manager you are losing. Get in front of it. Innovate on how you should be measured and developed and managed. Never fall behind on this. 9. Try to find the trifecta job. Something that you're good at, something that someone will pay for, and something that you love. 10. Firing someone is almost always the best thing for the person being fired. I've worked in a lot of cut-throat environments and I've seen a lot of people get fired and I've fired a lot of people. Not once can I point to a time where it wasn't the best thing for the person and the company. Both sides always wind up in a better place. And be respectful to people that get fired. Someone that is awful at their job could easily be a top performer somewhere else and someone that is awesome at their job could easily be a bottom performer somewhere else. It's all about fit. 11. Credentials are meaningless. I've worked right alongside several Harvard Business School grads and several software engineers from Apple. There's absolutely no correlation between success at work and these credentials. 12. Hiring good people is really difficult. The traits I look for are grit, adaptability, curiosity and humility. These things are almost impossible to measure in a traditional interview. 13. Admit when you're wrong. If you're the kind of person that can't admit when you're wrong, please stop being that kind of person. Being wrong and admitting it 1,000 times is way, way better than being wrong one time and not admitting it. Embrace being wrong. 14. Be a lynchpin. Seth Godin has a book on this that you should read. But the point is that you should run as fast as you can to be a completely critical piece of your organization. If you're not that, then try harder or move on to somewhere where you can be. 15. Always think in terms of metrics. Whenever you think about an initiative or a new role or a team structure, think of what metrics it will impact. If what you do every day doesn't impact your company's key metrics then you're not a lynchpin. Many have written before that email is ripe for disruption. Something has got to give and I think we'll see lots of innovation over the next few years. In the meantime, here are four features I would love to get added to Outlook and Gmail that would make my life a little bit easier: 1. Character count. I'd love a character countdown (from, say, 200) to appear in the top corner of a new email. It would be a critical reminder to keep emails short. I'd even love a feature that would not allow the email to be sent if it exceed a particular character count. 'Pithiness', as required by the 140 character limit, is the best feature of Twitter. There's no reason it shouldn't apply to email as well. 2. Like button. I stole this idea from a comment that Donna White made a while back. One of the best features of Facebook is the 'like' button. It's an incredibly easy way to let people know you appreciate something they've posted without engaging in a back and forth. It's a super-efficient, low effort way to keep in touch with lots of people. Instagram and Twitter do this as well. I'd love the same feature to be added to email. Instead of having to respond with a one or two word response, the reader could just 'like' the email and that could be tracked and not require a new email to be generated. This would probably reduce the volume of email by 20%. 3. Reply tracking. I'd love to be able to click on a folder that show all of the emails I've sent that haven't been responded to for easy follow-up and tracking. I know there are plug-ins like Toutapp and Yesware but they're painful to install -- this is so basic it should be native to email programs. 4. External/internal reporting & filters. One of the pitfalls for people that are externally facing is ensuring that you're focusing the right amount of energy towards customers as opposed to internal work. A simple widget that tracks the percent of email flow that is internal versus external over time would be super useful. In addition, it would be great to have the ability to easily switch between internal and external inboxes and sent items folders. The number of options they have. The current valuation of the company. The total number of shares outstanding in the company. If an employee doesn't know these three things they should place no economic value on their options. Don't get me wrong, employees should take the options if they're offered, especially if they believe they're working for a high growth company, but the options should not be considered a measurable part of their compensation package. You can't value something if you don't know its value. This is so true. I've been fortunate to work with incredibly smart people with incredible credentials: people who have worked at the top consulting firms and investment banks that have worked at some of the world's most admired companies -- Goldman Sachs, Apple, Google and Amazon -- and have attended the best colleges and business and engineering graduate programs. But when I think back on the people who were successful in the start-ups I've worked in, I've seen that there is almost no positive or negative correlation with those great credentials (great companies, great schools, high standardized test scores) and actual success in the workplace. As the quote suggests, it really isn't the smartest or the strongest that are the most successful. To emphasize this point, it's helpful to use a sports analogy here (I like sports analogies because sports is very results-driven and the results are extremely transparent).Regarding strength, you might think that the best NFL players are the strongest and most athletic and come from the best college football programs and had the best college football careers. But this isn't true at all. There are countless instances of great college football players not making it in the NFL -- particularly in the more complex and cerebral positions. Case in point: Tim Tebow won the Heisman trophy and a national championship at the University Florida, Tom Brady was a third string backup at Michigan. Regarding intelligence, each year every professional football recruits takes the Wonderlic Test. It's a test that measures the intelligence of the player and is often used in making decisions about which players to draft. You might suspect that higher scores lead to greater success. Wrong again. Ryan Fitzpatrick, the Harvard educated, backup quarterback for the Tennessee Titans scored a 50 -- the highest score of any current player in the NFL. Peyton Manning, arguably the best quarterback in the NFL, scored a 28. I see the exact same thing in the workplace. It isn't great credentials or talent or SAT scores that makes people successful in a start-up, it's traits like grit and humility -- and perhaps most of all, adaptability. Something to keep in mind when looking for "A-players" to join your team. I was asked to participate in Lifehacker's How I Work Series where writers answer a series of questions on their work life. I thought I'd post my answers here. Here goes. Location: I'm based in Manhattan (live in Flatiron, office in Soho) though I'm on the road in another city about 40%-50% of the time. Current Devices: iPhone 5S, ThinkPad T420s, Eccolo journal, Cross pen, Kindle. What apps, tools, software can't you live without: A bunch. I use Wunderlist to manage my to-do lists, the Cal app to manage my calendars, Evernote to manage notes, TripIt to manage travel itineraries, Google Maps to navigate, Salesforce to manage client stuff, LinkedIn to manage connections and Feedly to keep up on work-related news and blogs. I use a lot of others but those are probably the apps I use most frequently for work. What's your workspace like: I try to have a minimalist workspace so that it feels the same no matter where I am (home, office, plane, train, hotel, etc.). I try to eliminate paper and just have my laptop, phone and notebook on my desk. I do all of my calls from my iPhone with my headphones. I even try to do group conference calls from my iPhone's speakerphone. It's important to me to be equally productive regardless of where I am. A minimalist approach helps me do that. What's your best time saving short-cut/life hack: Working offline. At least twice during the work day I’ll turn my email to “work offline” mode and close my browser so there are no digital distractions. What everyday thing are you better at than everyone else: I'm not sure I'm better than everyone at anything, but one thing I think I do well is to take a complex situation, strip it down to the core issues that really matter and identify and prioritize solutions to improve it. I think I’m pretty good at getting through the clutter that makes situations more difficult than they need to be and coming up with actionable solutions that will work. What's your favorite to-do list manager: I've used a ton of different to-do list tools over the years and I think (hope) I've finally found a keeper with Wunderlist. It's super simple and the mobile and desktop experiences are really seamless. What do you listen to while you work: I almost always listen to music while I work. The music I listen to while working is pretty different from what I listen to when I'm not. Right now it's the Bon Iver station on Pandora and a couple of different playlists on Spotify -- the "Your Favorite Coffeehouse" playlist is a good one. What are you currently reading: Lead with a Story: A Guide to Crafting Business Narratives That Captivate, Convince, and Inspire by Paul Smith and That Used Be Us: How America Fell Behind in the World It Invented and How We Can Come Back by Thomas Friedman and Michael Mandelbaum. What's your sleep routine like: I take sleep really seriously. I freak out if I don't get at least seven hours. I try to get to bed by 11 and up between 6:30 and 7, though more often than not I go to sleep later and get up earlier. What's the best advice you've ever received: This is a tough one as I've had some great mentors that have given me some great advice over the years. But one that sticks out is: "attitude is everything". The most consistent trait I've seen in people that are successful is that the vast majority of them have a great attitude in work and life. If you have a job, especially if you have a good job, that pays a decent wage, the odds are that it's only a matter of time before your employer outsources, automates, or finds a way to do the work that you do more cheaply. And when they do, you're either going to take a pay cut or you're going to be out of work. The days of working in the same job for 30 years, getting a nice watch every decade, and a retirement party at the end are long over. In a global economy, mediocrity is unsustainable. Companies must constantly be getting better -- faster, smarter, more profitable. Successful companies are perpetually searching for ways to cut costs and add efficiency, and that includes getting rid of expensive humans. The first option is to fight it. Stay below the radar and try to fit in. Make friends with your boss and delay the inevitable. Don't make a raucous, don't try to scale things. Stay quiet and stay out of the way. This is not a bad short term strategy. It will likely work for some amount of time. But in the long-term, the forces of profitability and efficiency are going to catch up with you and your average performance will be out the door. The other option -- the much, much better option -- is to embrace this reality. Instead of fighting it, actually help your company outsource, automate or cheapen the things that you do. You should help make your job more scalable. There's nobody in a better position to identify which tasks can be done more cheaply and which tasks can't. Help your company identify those things that can be done more cost effectively and come up with ideas on how they can be done more efficiently and advocate for it. You don't want to be doing that kind of work anyway. You want to be doing the hard stuff that adds value. And this will allow you to spend more time on the stuff that your company needs. And after you’ve scaled your current work, do it again. Keep cannibalizing your own job. Of course, depending on the complexity of your job, it could take a long time to cannibalize yourself. In some cases it could take years. Also, note that once you cannibalize yourself, you don't have to leave your company. Just the opposite. You should be thriving at your company and getting promoted, or at least spending more time on more valuable work (which you should be compensated for). So in your job today, keep producing -- writing great code, building great products, closing big deals, etc., but while you’re at it make sure you’re aggressively looking for ways to scale -- before somebody else does.